Spring has sprung in Chicago!!! Which means my allergies are in full swing and I don’t even mind. Because it is sunny and warm and I’m pretty sure it smells like spring (hard to tell between the sneezes and wads of Kleenex). I absolutely love living in a place with seasons. Just when you feel all hope is gone you spot that little green sprout or that budding tree and are given a sign that change is coming. I honestly don’t know if I could live in a place that didn’t have all 4 seasons. I just wish summer lasted for most of the year and winter lasted for 1 month…but I’ll take what I can get. IT’S SO NICE OUT! I’m hoping to cover a giant list of to-do’s that I’m going to start tackling today. Some spring cleaning is at the tip top of my list. We also are going to swap out our closet, ADIOS winter jackets, and spend some time cooking and baking. Its been way too long since I was last behind my camera and I can’t wait to share some tasty food with you! 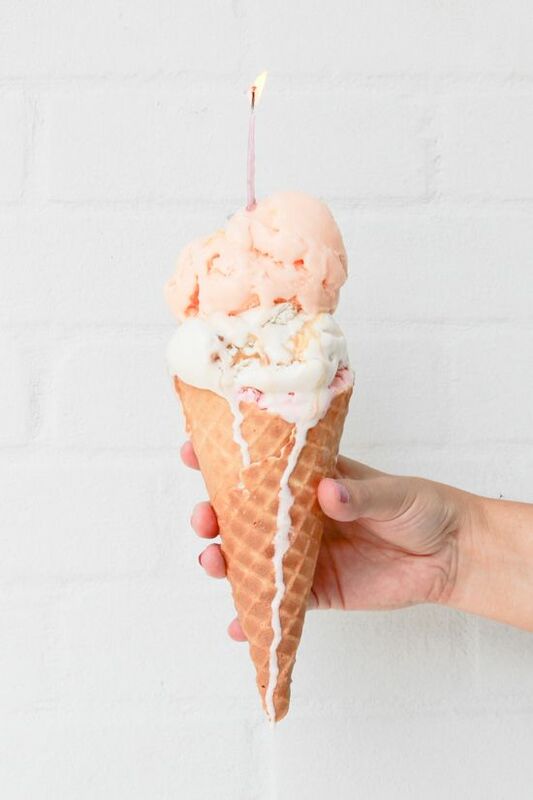 It’s so warm and I’m feeling inspired to make some ice cream like the beautiful picture below. I have had one of those weeks where I am overwhelmed by the people and world around me. I busy myself so quickly and it drives me crazy at times. I am really trying to slow our summer down this year to enjoy friends and family as well as time with just Mikey. He has been so sweet to me during this yoga training and is literally the worlds greatest cheerleader. He took me out to dinner at this delicious restaurant, Solero, to celebrate last night and I couldn’t help but tear up as he talked about how proud he was of me for chasing my dream. I’m just amazed by his love and I want to spread some of that around to everyone. I also have a best friend who has been in the hospital since last week. She is pregnant with twins and still has 3 months before we need to meet them. We went to visit her and I was inspired by her positive and happy attitude. I had been texting with her all week, telling her we love her and are praying for her and God completely honored our prayers. She was able to go home yesterday! What we thought was going to be months in the hospital ended up being a little less than a week! She’s still on bed rest at home, but the fact that she gets to relax in the comfort of her own home makes us all so happy! It’s so easy to get caught up in the glamor that is social networking and blogging and begin to feel sorry for ourselves. Not skinny enough, not creative enough, not enough free time, too much free time…the list can go on forever. If I’ve learned anything on my yoga journey it is that we can’t control our future. The only thing we can shift is our perspective on life and live for right now. Life is a series of passing moments and they are gone just as fast as they appear so we have to make the most of them! Maybe for you that means stepping outside your comfort zone this weekend. Maybe you start a new project or put that to-do list to the side and focus on someone who needs some love. Spring means fresh, green veggies. 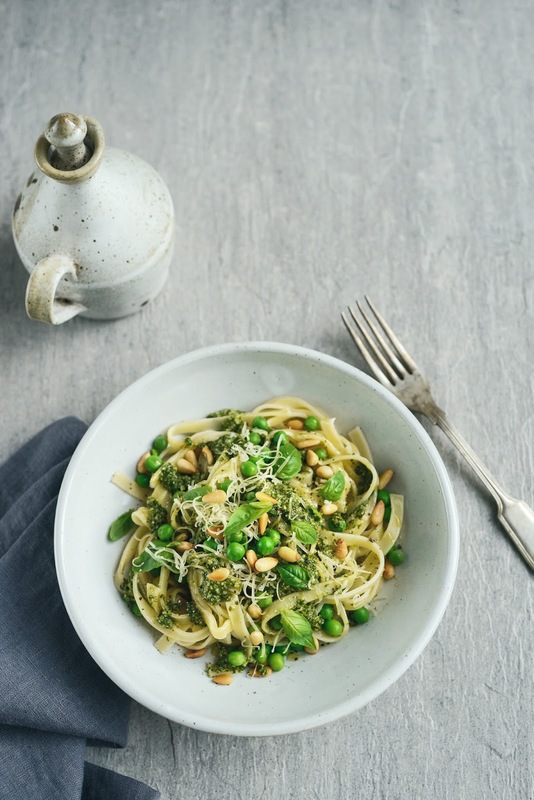 I love how light and fresh this pasta with pesto, peas and pine nuts looks. Get in my belly. 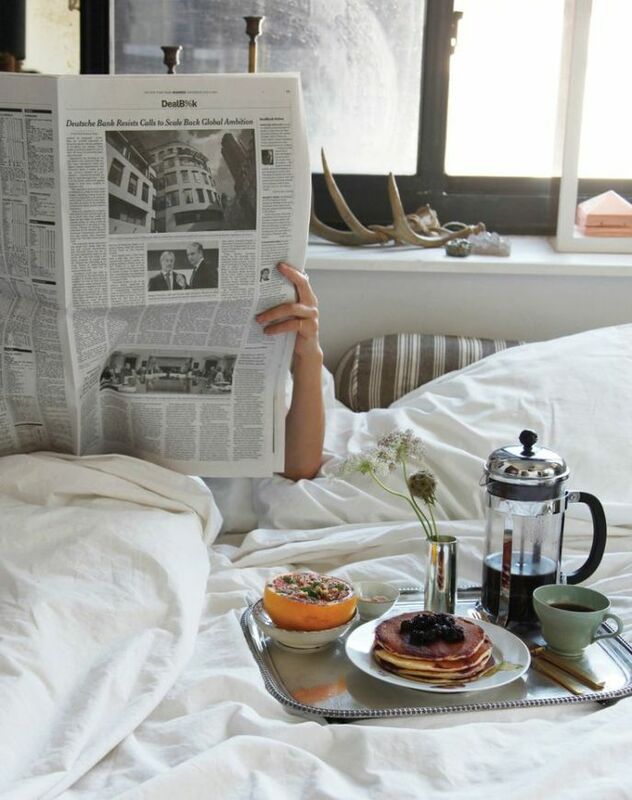 I don’t know why I’m so obsessed with others’ breakfast in bed pictures. I’m going to tell you something. Breakfast in bed at a hotel is great. You have room service and you don’t have to clean the crumbs up out of the sheets. I’m a VERY messy eater. I require a ton of napkins. I can’t handle a single crumb, grain of dirt or anything that is not soft, comfy sheets in my bed. If there is a speck of something I have to get up and swipe it out. So breakfast in bed sounds like a nightmare to me. Crumb city. I do enjoy this lovely picture however. My version would be…me on my iPad, with a cup of coffee and a bagel on the couch…I think that’s my version of a perfect breakfast in bed. I would love to live in this house. I think it’s my dream home. I say that a lot but this is really it (at least this week). 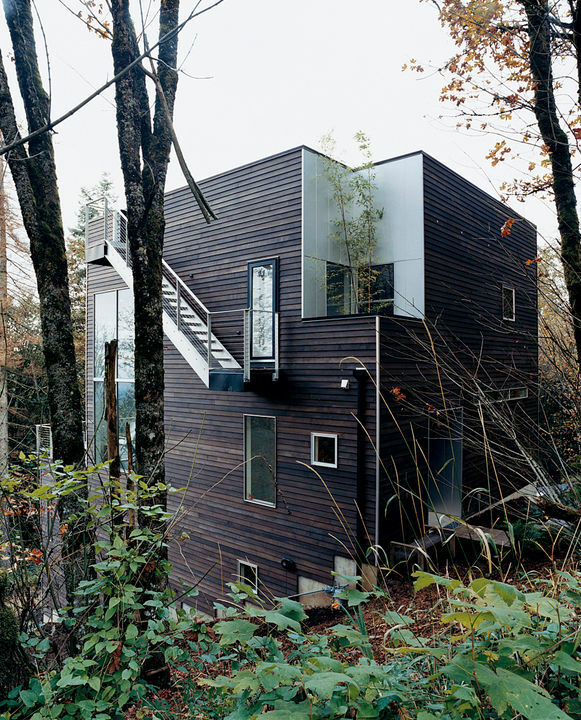 A loft in the forest? Okay sure, sign me up. 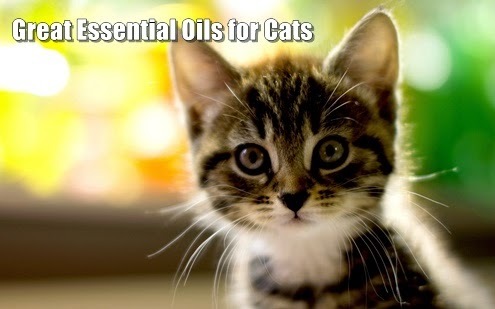 Last and of course not least…yes, you can use essential oils on your pets. This website has all the details you need to know. Of course, check with your vet first. And let me know if you want to get set up with someone who sells doTERRA! I know a bunch of people through my yoga community that would love to teach you all about the magical wonders of oils! Even for your little furry friends! Ese plato de pasta con verduras me ha dado una envidia tremenda. Lástima que no esté la receta.